We generally recommend you book your first appointment 6-8 weeks before your wedding. This allows for multiple fittings as well as giving you peace of mind that your dress is in good hands while you work on all the other details. For the planners that like to get things done months ahead of time, you don’t want to come in too early as it is best to finalize the alterations closer to the wedding to ensure a perfect fit on the day of. If you are too excited to wait or are redesigning a dress completely you can always do an initial consultation to get an understanding of the amount of work that needs to be done and receive a quote for that work. Having the right shoe and undergarments (if you are wearing any) is crucial to a good fit. While a lot of dresses have an internal structure built in, some don’t. A proper bra that gives you the support you need and can completely change the look of the dress, giving you more lift and a smaller waist. If you are unsure what undergarments are best, don’t worry we can help advise you on your first fitting. The process generally goes as follows: you have an Initial Consultation to talk about your wants and for your stylist to make recommendations how to get the perfect fit you are looking for. During this time your stylist will pin what it needed for the Second Fitting and give you a quote for the work discussed. Between your Initial Consultation and Second Fitting we generally only work on the top and body of the dress, not the hem yet. We will take in or let out without completely finishing the seams or relaying the lace back until we’ve checked and confirmed the fit. The Second Fitting is when we check the work done and often pin the hem. Some dresses will require more fittings in which case the hem will often be the last item to pin before the Final Fitting. The Final Fitting is when everything is done and we are taking a last look to ensure everything is perfect for your big day. 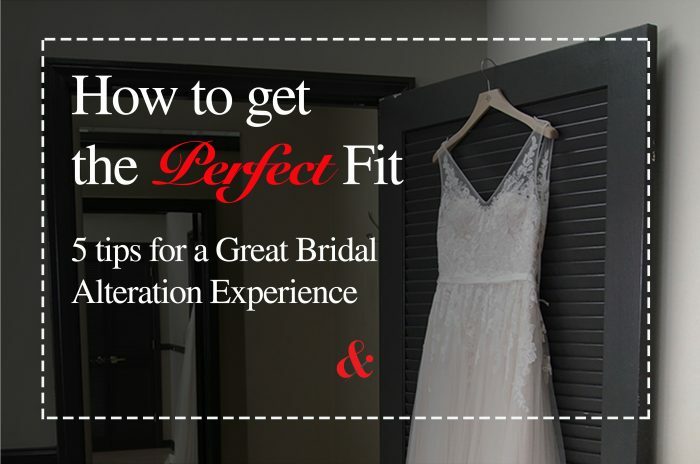 Adjustments can still be made if needed, but generally, this is when you get to take your dress home! Weddings are an amazing time to spend time planning and preparing with your closest family and friends and it is natural to want your support team with you at your fittings. However, fittings are really a time for you and your stylist to talk about your wants and how those wants can be met. We recommend only bringing one or at most two people to your fittings. The Initial Consultation is a great time to bring your close confidant who you know will tell you their honest opinion but not overpower your voice. Middle Fittings are a good time for those that make you feel good and you want to share the fitting experience with. For Final Fittings, we recommend bringing the person who will help you with your bustle so they can learn from your stylist any tips or tricks. 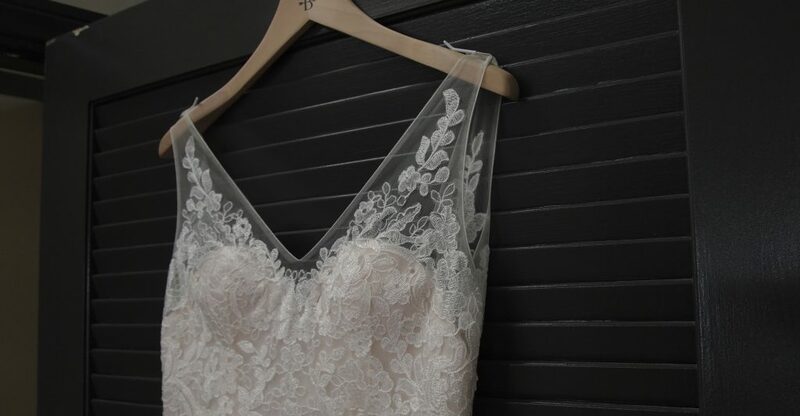 The fitting process is the best time for you to enjoy your dress and to see what details work best. Bring your veil and jewelry to see the complete look. What a belt? We can custom make one for you or attach the one of your choice. You can also consider making your hair trial before a fitting to see how it looks with the dress on. Our only recommendation is not to have makeup done before a fitting as it can get on the dress. And remember to enjoy the process, this is your moment and we are here to help you feel your best!